No matter for a new built building or refurbishment of exsiting one, there should be a basic requirement of air exchange rate. This principle is to make sure the interior CO2 below 1000ppm. The air quality is supposed to be related with the users' comfort and their working productivity. BWK uses mixed-mode ventilation strategy to support clients' projects. In some situation like summer night, NV could be introduced to flush up still air. 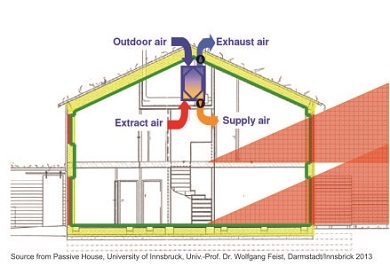 In other situation, mechanical ventilation with heat recovery would be activated to replace window ventilation. When MVHR system is mainly installed for whole building ventilation, fresh air is supposed to deliever to living area like living room and bedroom. That is for hygiene issue air will be extracted from kitchen, toilet or even storage room whose air is with wet and unpleasant smell. 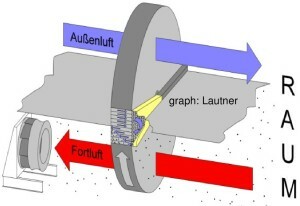 The air automatically and gentlely flow through supply and extraction area with positive pressure and negative pressure. By this way, it is confirmed that the air of the whole building is continuely replaced by fresh and filtered air. 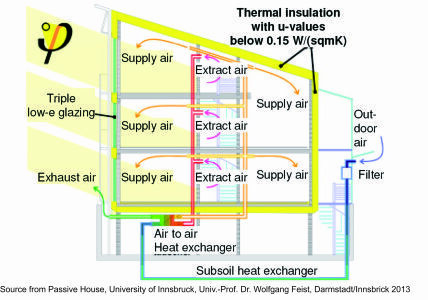 MVHR is crucial for Passive house design. And it makes sure the internal space air always fresh. In terms of its structure, the different streams of air are separated by profiled metal or PVC plates. With the use of ducts (fin-counter-flow heat exchanger) it is possible to further increase the relevant heat exchanging area.